Share "Choosing an Aquarium Filter"
A proper filter is the most important piece of equipment needed to keep an aquarium healthy, but how do you choose the best filter for your tank? Mechanical Filtration: In a mechanical filter, water is forced through a medium that physically catches particles and debris so it does not continue to circulate through the water. These filters can be cleaned and refreshed to keep water at its best. Chemical Filtration: Chemical filters have a chemically-treated medium that water is forced through, and as the water comes into contact with the medium, undesirable chemicals in the water are neutralized, cleaning the water. Biological Filtration: These filters use specific bacteria in an ecological balance to break down debris or unwanted chemicals to clean the water, returning cleaner water to the tank without risking unnatural contamination from filter malfunctions. 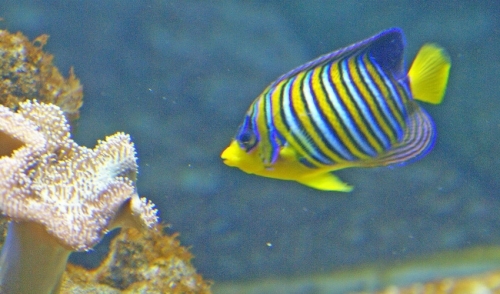 The best filters combine more than one technique to keep aquarium water clean and healthy, and many filters use all three types of filtration simultaneously. Box or Corner Filters: These small, compact filters are positioned in the corner of a tank and often use a foam medium for both mechanical and chemical filtration. They take up tank space and are highly visible, but are also less expensive. These filters are useful for small tanks with small fish, but are not as efficient for larger aquariums. Under Gravel Filters: These larger filters are positioned at the bottom of a tank under a layer of decorative gravel, and typically use biological filtration to clean the tank. They are ideal for beginners and need very little maintenance other than occasionally vacuuming, but they should be supplemented with additional filters in large tanks. Power Filters: These larger, more efficient filters are usually attached to the side of a tank and are positioned in the water. They often employ all three methods of filtration, and are available for all different tank sizes and styles. Some models can be noisy, and serious aquarium hobbyists may not like seeing the filters in the tank. Canister Filters: These are large, efficient filters that can easily handle big tanks that are home to big fish and large schools. These filters are typically stored beneath a tank in a large case or stand, but are great options for more elaborate tanks. There are other types of filters as well, such as wet-dry filters or trickle filters, but they are recommended only for the most advanced aquarium keepers. Several factors must be considered when choosing the best filter for your aquarium. Tank Size: Larger tanks will require larger, more efficient filters, while smaller tanks can be cleaned with more basic options.. Fish Population: A tank with more fish or larger species will require better filters to thoroughly remove waste and unwanted chemicals. Fish Sensitivity: Some fish are more sensitive to water changes and chemical balance and will need more efficient filters to stay healthy. Water Quality: If local water supplies are tainted or less suitable for aquarium use, a better filter will be necessary to keep a tank clean. Maintenance: A better filter will keep a tank clean longer for less additional cleaning and maintenance, but filters themselves also need cleaning. Cost: Better filters have higher price tags, but the cost can be worthwhile for more efficient operation or to protect more expensive or delicate fish. By choosing the right filter, aquarium maintenance can be minimized and fish will live healthier, longer lives as part of a fresh, clean tank.